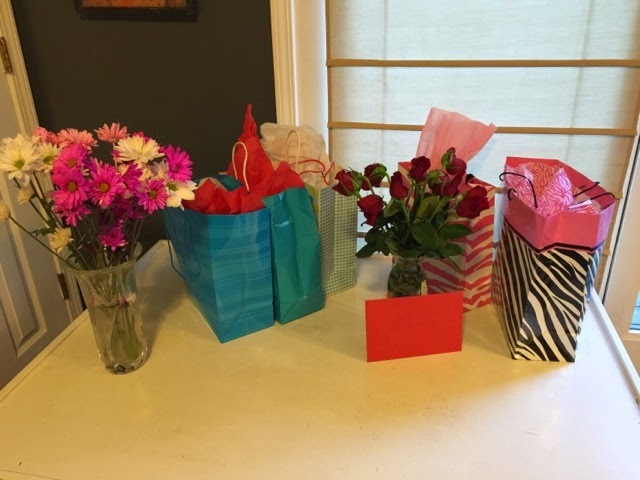 Valentines Day at our house was filled with love. I have came to the conclusion that my husband and I will not get a romantic Valentines Day dinner for the next 10 years or more. But that is okay. I would rather have a romantic dinner for four than just dinner for two. Valentines day is about being with the ones you love, not just one that you love. 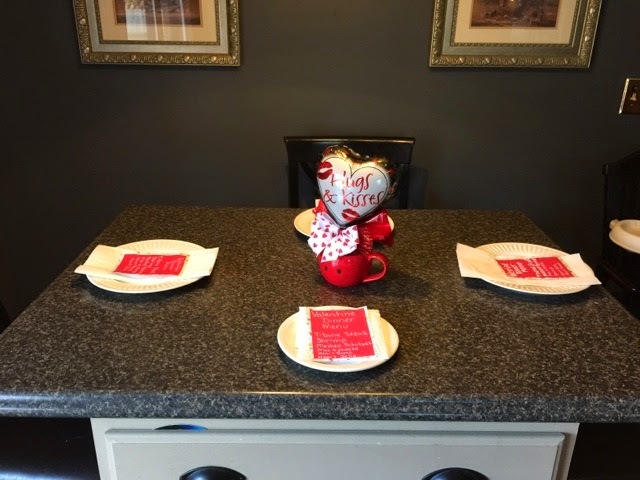 So this past Valentines Day I sat the table for four. 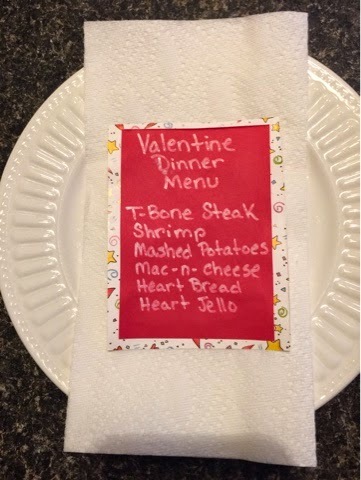 Our menu consisted of T-Bone Steak, Shrimp, Mashed Potatoes, Mac-N- Cheese (not the box kind), Heart Shaped Bread and for dessert Heart Shaped Jello. The homemade menus were a big hit with my family. I think it made the perfect touch to our dinner. I was so excited on how the T-bones turned out. If you followed along this past summer on my grilling adventures, you would remember that I am trying my best to become a great cook on the grill. I researched and researched on how to grill the perfect T-Bone Steak. 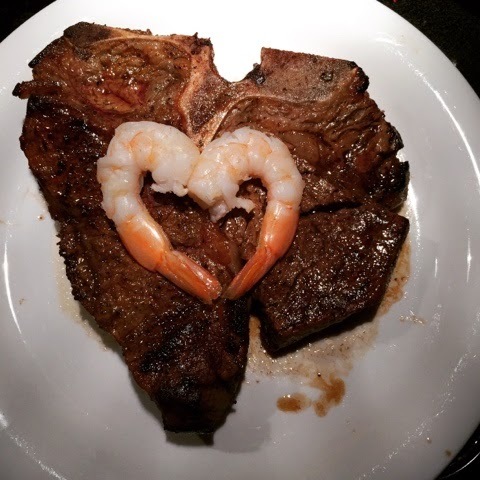 After spending days and days on Pinterest and the web, reading up on how to fix the perfect steaks, I decided to try my luck this Valentines Day. I marinated the T-bones in Allegros Game Tame, Geek Seasoning, Pepper and Salt. I made sure that there was plenty of salt on both sides of the steak while they marinated. I read somewhere that the salt helps break down the fat and it gives it a great taste. From what I read, the best way to get that restaurant quality steak, is to pan fry then bake. Doing it that way will make your house smell. I wanted to use our grill, granted that it was freezing outside, I wanted to conquer this steak on the grill. Did you know you can use your cast iron pan on the grill? Why yes you can. To start cooking these melt in your mouth steaks, you need to pre heat your grill, you want your grill hot, hot. I have a 5 knob gas grill. I only turned on 3 of those knobs and I placed them on high. As you are starting up your grill grease your cast iron skillet and place it on the rack of the grill. You want your cast iron to warm up gradually. If you don't let it warm up gradually you run the risk of the cast iron cracking. When it is time for the steaks to go on, you first want to sear each side of the steak. Before you put the steak on make sure there is a good coating of pepper on each side. Not to much, enough for your liking. When you are ready to place that bad boy on the grill place it in the cast iron. It will sizzle the moment you lay it on the cast iron. I let each side sizzle for about a minute, to a minute and a half. Once each side had a good brown coating I grabbed my oven mitt and moved the cast iron pan (with steak still in it) to the side of the grill away from the burner that is on. I left only two of my knobs on and I left them on high. When doing T-Bones you want to place the filet on the side totally away from the heat, leave the strip sirloin toward the heat. You will let you steak cook until it is to your liking, flipping it so often, but always leave the filet away from the heat. This was the best steak I have ever made. The filet side would melt in your mouth. My mouth is watering so much I think I want to make it again for supper tonight. After eating this delicious steak dinner I broke out the Jello that had cool whip on it. When I was making it, I hoped that it was going to look more like a heart shape, but it did not. I placed the jello in the glasses, and then I tipped them in fridge to chill. 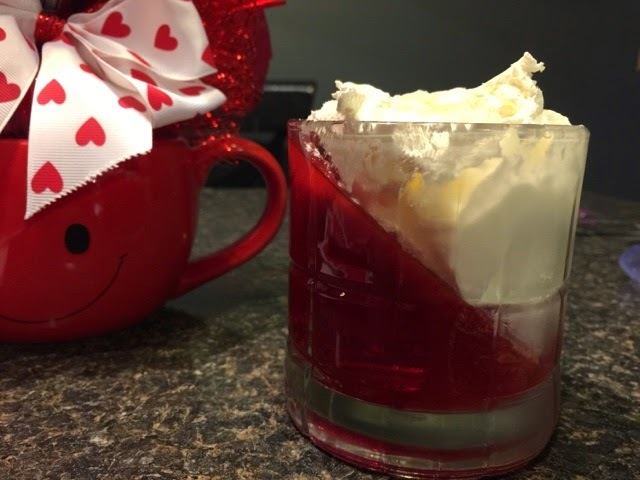 Then I added cool whip to the glass. The kids loved the jello. Even if it did not look so much like a heart. After we ate we gave our Valentines their gifts. The roses looked 10 times better the next day. Hope you all had a wonderful Valentines Day just like we did. Good Luck on making that melt in your mouth steak.